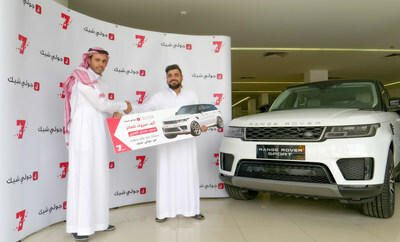 RIYADH, Saudi Arabia, March 21, 2019 /PRNewswire/ -- On March 19, Jollychic wound down its 7th anniversary with the presentation of a Range Rover worth $100,000. Mohamed Bin Hamdan AlOnezi of Saudi Arabia, a hotel employee who lives in Riyadh, won the prize. "When they told me that I won the grand prize from the recent Jollychic 7th anniversary celebration, I was out of words. I couldn't believe it," Mohamed said. Mohamed and his family started shopping at Jollychic around two years ago. They buy almost everything from the app, like clothing, home goods and electronics. Jollychic has become a pivotal part of their lives. "Jollychic has been our place to go for shopping, and we find many things we need and want," he said. This month, Mohamed's family ordered some clothing and home goods from the app and noticed that there was a celebration going on where people could win a prize by inviting friends to light a candle for them on Jollychic's pages. Mohammed entered and won. "Jollychic is a company that works hard to deliver on its promises. Our team is devoted to bringing people and families in the region a better life. We highly appreciate the support we get from our customers and strive for their satisfaction and happiness," Jabri Mohammed, marketing VP of Jollychic Middle East said. The winner said he was grateful for the prize: "Jollychic is our favorite e-shopping app; we're so thankful for this prize and the opportunities Jollychic has afforded us because of it. Jollychic has shown they truly appreciate their customers."